Purchase of Trenton Bridge Lobster Pound's wholesale operation means lobstermen will have more control over the prices they get for their catch, a spokesman says. The Maine Lobstering Union voted Saturday to buy a wholesale lobster business near Mount Desert Island to help its fishermen net a bigger share of the profit in the booming, $1.5 billion-a-year industry. At a closed-door meeting in Rockport, members voted 63-1 to buy the wholesale side of the Trenton Bridge Lobster Pound, which includes a tank that can hold up to 180,000 pounds of lobster, for $4 million, said Local 207 President Rocky Alley. The vote enables the Maine union to borrow money from a Kansas City bank and to borrow $1.1 million from fellow locals in the International Association of Machinists and Aerospace Workers as far south as Maryland to purchase the Lamoine-based wholesale business. The Trenton Bridge manager, Warren Pettegrow, will stay on as the chief executive officer of wholesale operations, as will the employees. The operation will continue to ship live lobsters nationally and abroad, including to the European Union and Asia. “This really is all about putting lobstermen in the best position to secure their future and their way of life for future generations,” said Pettegrow, who operates a boat that transports lobsters and has been buying MDI lobsters for years. Eventually, the lobstering union expects to buy Pettegrow out, officials say, but he will still be owner of the family’s well-known retail operation on Route 3 in Trenton, located just over the bridge on the drive to Mount Desert Island. When the purchase is finalized, union lobstermen from Jonesport, Mount Desert Island and Vinalhaven can sell their lobsters directly to the union cooperative, which was established in 2013, for storage at the Lamoine facility and eventual sale. Union fishermen who sell to the co-op will get market price for their lobster, but they will also receive a share of cooperative profits, or a dividend, at the end of the year once operational costs, like trucking and employees, are covered. In time, the union hopes to expand its buying territory to the whole Maine coast. Reached after the vote, Alley said he wanted to thank IAM president Robert Martinez and the executive board for believing in the lobster fishermen of the state of Maine. “This has been a dream of ours for two years, and we couldn’t have done it without them,” he said. The Maine Lobstering Union formed in 2013 in the wake of an infamous 2012 spring glut that drove boat prices to a season average $2.69 per pound, down from about $4 per pound during recent years and the lowest yearly average in 20 years. The union has lobbied the Maine Legislature on behalf of its members, and has raised some objections to local projects that would affect their members – such as dredging in Searsport and in Casco Bay – but it has long wanted to launch a statewide cooperative. Lobstermen often complain about the large gap between the boat price for lobster and what a consumer pays to eat a lobster, even in a Maine restaurant. They don’t understand why rising consumer prices don’t always translate into higher boat prices. The union has about 500 members who have been active at some time since its launch, but not everyone pays the $62.70-a-month union dues on time. That is why the vote tally on Saturday was so low, union organizers said. There had not been a fishing union in Maine in more than 75 years, when efforts to revive an earlier union ran afoul of federal price-fixing laws. But IAM lawyers found a loophole in a 1934 fishing law that allows a union to negotiate prices on behalf of fishermen. Canadian fishermen have been organized for decades, but most don’t negotiate catch prices. Deep-sea fishermen that work on halibut, sablefish and crab boats off Washington and Alaska have union representation, too. 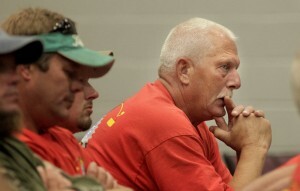 David Sullivan, the head of IAM’s eastern territory, applauded the results of Saturday’s vote. “The members of the Machinists Union are proud to stand beside the lobstermen of the state of Maine as they fight to preserve their communities and their way of life,” Sullivan said.